One of my favorite true life stories about cryptography is the breaking of the Enigma cipher in World War II. And I can’t possibly do it justice in a couple of short blog posts. I highly recommend reading the whole story in one of the books written about it, such as The Code Book by Simon Singh. 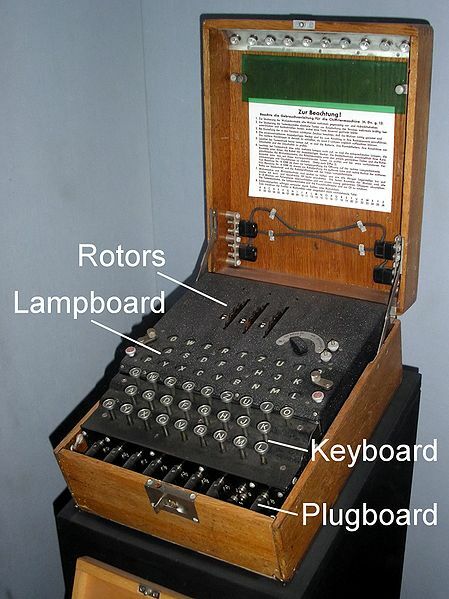 Enigma was a machine used by the Nazis to encrypt their radio transmissions. The picture is an actual Enigma machine. The Germans’ encryption in WWI had been broken by the Allies, so by the time of WWII they had switched to something far more difficult to break, and that was Enigma. The codes could be changed daily by changing the settings of the machine, which meant the Allies were faced with a new cipher every day. Previously, cryptanalysts had been linguistics experts, but in attempting to crack Enigma, Poland tried a new approach. They recruited twenty mathematicians, all of them fluent in German, and tested them to determine their aptitude for code-breaking. They hired the three most talented, one of whom was Marian Rejewski. Rejewski figured out that the daily encryption key was enciphered twice at the beginning of every German message. A spy had succeeded in capturing documents describing the wirings of the Enigma machines. And through a very complicated process I can’t possibly go into here (plus I barely understand it), Rejewski broke Enigma, and German transmissions became transparent to Poland for most of the 1930’s. Unfortunately for Poland, German changed Enigma, strengthening its security, in 1939. Rejewski probably could have broken it again, given enough time, but time was something he didn’t have. Hitler was about to invade, and he knew it. This is the part of the story I absolutely love. Poland knew they had no hope of stopping the Germans. So rather than let Rejewski’s work on Enigma die and be lost to the Allies, they decided to share their knowledge with France and Britain. They smuggled all their information about Enigma into those two countries in July and August of 1939. In September, Hitler invaded. Later, Britain would use Rejewski’s knowledge to break Enigma again. 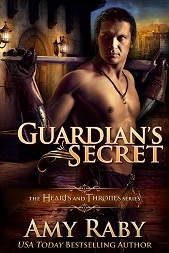 If they had not done so, the war would have proceeded quite differently–and probably not in a good way. Rejewski fled to Britain in 1942, where he continued to work on ciphers, but sadly he was excluded from further attempts to break Enigma at Bletchley Park. This entry was posted in Fantasy, History and tagged cryptanalysis, cryptography, enigma, fantasy, history. Bookmark the permalink. Awesome. Why was Rejewski excluded from further Enigma deciphering? According to the book, nobody really knows. Maybe they didn’t trust him. Or maybe they didn’t know who he was, because everything about Enigma was classified. During the war, Rejewski knew nothing about the work going on at Bletchley Park. I thought I knew the story of Enigma pretty well, but I had no idea that the initial work had been done by a Pole. One nit, though: The Nazis’ encryption in WWI had been broken by the Allies… I’m pretty sure the Nazis weren’t the ones encrypting anything in WWI.